My little girl loves pressing buttons. As soon as she became aware that buttons existed she was drawn to anything that has them. If the buttons actually do something, she’s absolutely enthralled. She’s a good kid, even as a toddler under the age of two, so she doesn’t tend to mess things up too often by, say, pressing the power button on the family XBMC machine or mashing remote controls left on the coffee table (though she does carefully press the buttons she’s familiar with). I gave her a cheap keyboard a while back, which she enjoys playing with, but since it isn’t connected to anything, the fun of pressing those buttons wears off pretty quickly. Months ago I envisioned building a simple toy that would consist of little more than buttons and lights, with each button press activating a light of some sort. Once I had a grasp of what I wanted to build and how to piece the components together, I put together a shopping list. Just making sure I actually know wtf I’m doing before I go soldering things up! Before I even started marking where I would drill holes, I wanted to make sure I understood how to wire up the components I had purchased. So I loaded some batteries into the battery case I bought and experimented with an LED and some resistors. I quickly realized I had no idea how to even determine which resistors were which, so I made liberal use of this handy resistor color code calculator (I actually bought a wide variety of resistors, much more than what’s in the parts list above. And they arrived un-labeled). It doesn’t matter how the switch is oriented. The diagram to the left applies regardless of which contact you decide to use as your input. It was definitely handy to have that bypass output contact, because it meant I didn’t need to do a ton of splicing inside the box. Instead, each switch’s input was connected to the previous switch’s bypass output. Pretty cool! First, lay out the parts on top of the box, then break out a ruler and sharpie and mark where each component will be installed. Next, drill two 1/16″ holes for each LED. I didn’t measure the distance between the LED leads, I just eyeballed it and it worked out pretty well. Go ahead and glue the LEDs into position with the high strength adhesive you got for this project. Buttons are next. I thought I would be able to mount the button bodies inside the box and have just the caps sticking out, but the box I got was too thick so I wound up drilling holes for each contact instead, and mounting the buttons to the top of the box. I used a 3/32″ bit to drill the holes so it would fit the leads and soldered wire. This is also where I broke the top of my acrylic box by pressing too hard when I drilled the first hole. After that was repaired, I let the heat of the drill bit do most of the work and used minimal pressure to avoid additional cracks in the plastic. As you can see in the photo above, I also glued the battery holder into place. Pretty simple. Next, I mounted the power switch on the side of the box. The body fit inside the box, with the actual switch protruding from a 1/2″ hole I drilled. 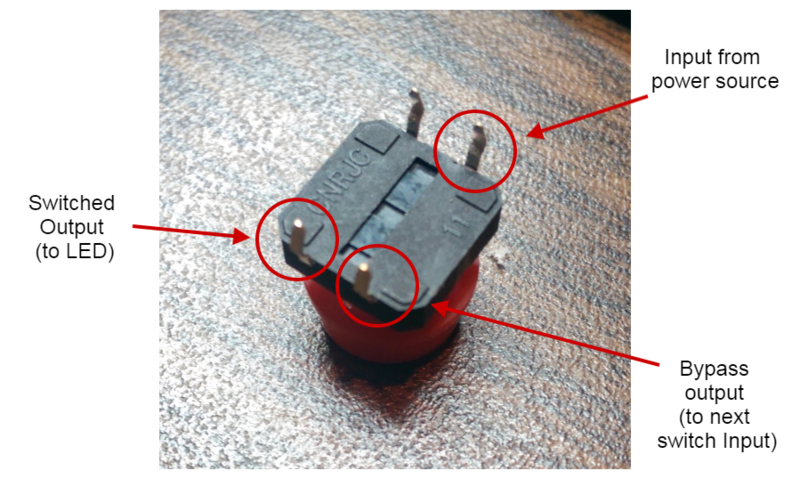 This particular switch worked perfectly for the project, its hex nuts making it simple to secure the switch to the box without the need for adhesive. Then I installed one button, in order to confirm that the overall design would function as I expected. After wiring this first button, I turned the power switch on. connected the negative lead from the battery pack to the negative contact on the first LED, then pressed the button. To my delight, it worked! So then I cut wires and put them into position in preparation for a bunch of soldering. Once the whole unit was functional, I decided it would be a good idea to have an LED indicator when the power is switched on. So I drilled a couple holes above the power switch and added a 5mm violet LED, then wired it up using available leads from the power switch and an LED. This LED was a little too bright, so I used a 330 Ω resistor on it so it remains suitably visible without being overly distracting. Power LED lights up when the unit is turned on. And here are a couple more shots of the completed device, fully functional. When I first showed this to my daughter, within 90 seconds she had removed the caps from two of the buttons, which I immediately realized are fantastic choking hazards for a small child. So, I glued those puppies tightly to the button bodies. Another issue is that she also quickly figured out how to open up the box and started touching the insides. This isn’t especially dangerous, but it is likely to result in a non-working toy pretty quickly. So I used a small piece of nylon strap and screwed it into the top and front side of the box. I’m pretty sure that the screw holes will strip out after a half dozen battery changes, so hopefully I can come up with a better solution by the time that happens. Although, considering the batteries will likely last a very long time in this device, I may not even wind up changing them that often… my girls might outgrow the toy before we go through 15 AA batteries! I won’t attempt to even begin to theorize about the inner workings of a 21-month-old’s brain, so what I’m about to describe is highly mysterious to me but warranted a revision to my design nonetheless. This may not apply to older children, or really any children other than mine. After about five minutes of playing with her brand new LED Button Box, my little girl began placing her eyeball directly over the brightest of the six LEDs (white) and pressing the button to activate it. She thought this was hilarious, but of course I’m sitting there wondering how many times she can do that before she permanently damages her eyesight. So I decided to reduce the brightness of the brightest two LEDs (white and green) by pulling the existing resistors and installing higher ohm resistors in their place. After some testing, I settled on a 470 Ω for the white LED and 390 Ω for the green. Now they are still bright enough to enjoy but not so bright that I worry it’ll blind my kid if she stares at it for a few seconds. And of course I’ll also be discouraging that behavior. There are so many things one could do to make this toy more interesting, but most of them will require the use of a microcontroller, and that is a bit beyond my capabilities right now. Perhaps next winter I’ll be ready to tackle something more complicated as a holiday gift for my kids. If you have built electronic toys for your kids I would love to hear about it. Please link similar projects in the comments section below! 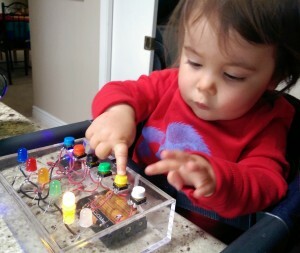 Quick update: My daughter has been playing with her LED Button Box for a couple of days now. I’ve found that it’s a really fun learning tool for a child her age (~21 months). She is learning about colors, on/off switches, and next I’ll be using it as an educational aide for learning to count (“Press two buttons now…”). I think this toy can also be used to learn more advanced concepts, like combining button presses to light up multiple colors at once and learning patterns. For example, I’m going to see if I can get her to copy sequences I show her when she’s just a little bit older, and challenge her to remember and reproduce longer and longer sequences. And maybe when she’s quite a bit older, we can do some morse code exercises with it, sending messages to each other across a room (I’m going to have to re-learn morse code, though… and I imagine it’ll be quite a while before she’s old enough to learn that supergeeky skill!). Great overview! She sure does like her new button box. It was the first thing she wanted her Grandmother to see when she came over. What’s the fun in that? Besides, she absolutely loves her new toy. And she’s quickly learning all kinds of fun stuff with it! It has now been over four months since this toy made its debut in my home. My daughter has spent many hours playing with it and it’s even been through a few drops and other physical mishaps. Yet it still works perfectly! The batteries have yet to need replacing, and nothing has broken or fallen off the device. Though I have been incredibly busy with work so far this year, I am hoping to start planning out a new version of this toy with some added functionality. I’m thinking sounds and one or two alternate modes of operation, based on a multi-position switch. I have yet to put pen to paper, so there are no concrete plans, but I wanted to give my readers an update on how this particular project has held up after a few months of use. For the next version, I am definitely going to avoid the acrylic box. Being able to see what’s inside is definitely a fun feature, but the material is just too fragile and potentially dangerous if it breaks since it’ll break into pieces with very sharp edges. If I can’t find a softer plastic that is transparent, I may go with wood (see previous comment). Ideas and suggestions are highly encouraged! First, I’m really excited to see there are others out there who thought of this already. My son (7 months) is absolutely nuts about illuminated objects — and the shadows they cast. He’s particularly fixated on LEDs. I like the corresponding button to light color on your box, and how you’ve thought about the learning experience as your daughter progresses. I’m visualizing chunky arcade-style buttons of varying colors (or translucent w/LEDs) for a bigger touch target at his age (or even larger Simon Says pads). At any rate, I’d love to hear about your progress since April on the this project. Thanks for sharing your efforts so far. I’ll keep you updated if I decide to work on a prototype. Thanks for your comment! It’s funny you should ask how the tow has held up since this article was posted… earlier this month my daughter dropped the box on the kitchen floor and it broke. While I was initially impressed with the strength of the acrylic box I chose, despite having put a big crack in it during the build process, it definitely broke into a half dozen jagged pieces upon hitting the tile floor at an odd angle. So I began researching other boxes. As I mentioned earlier, I have heard from one reader who used a wooden box for a similar toy. But I really like the transparent box as it provides opportunities to learn about electronics as my kids become more curious. So, I’m looking at picking up one of these two potential options (one, two), since they are polycarbonate and NEMA rated, and likely far stronger and less hazardous should they break. I have quite a few projects backed up on my work table, but once I rebuild the LED Button Box in one of these new enclosures I’ll be sure to post pics and details. Please let me know how your project goes. I would love to see photos with the larger buttons!